A consideration of the number of rooms per house in Wirksworth 1891-1901, and the number of people living in each room. 31 and 33 The Dale A pair of near-derelict cottages near the town center, blighted by quarrying at Dale Quarry, empty and deteriorating quickly in 1980. The left cottage, #31, was the George IV Inn in 1901, run by Fred Brooks and his wife Hannah. Typical of many buildings in The Dale in the late 1800's, these two cottages were saved and improved by The Wirksworth Project, for which the town was awarded the Europa Nostra Award in 1983. The Census for 1891 and 1901 indicated the "number of rooms occupied" in each house. This enables the average number of persons sleeping per room to be calculated, giving an idea of the degree of Overcrowding obtaining in some parts of Wirksworth at the start of the 20th century. 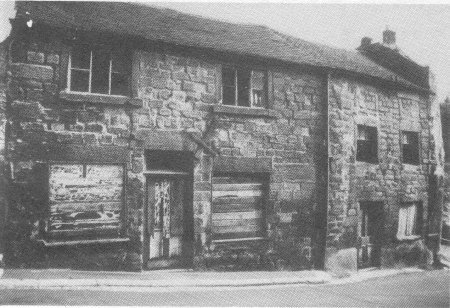 In 1891 Wirksworth had 4,615 people living in 879 houses (over 5 per house), 52% of all houses had 4 rooms or less, and 5% had more than 2 people per room, defined as "OVERCROWDED". In 1901 Wirksworth had 4,726 people living in 910 houses (over 5 per house), 40% of all houses had 4 rooms or less, and 5% had more than 2 people per room, defined as "OVERCROWDED". The 1901 Census Report did not try to assess the quality of the country's housing stock or its sanitary facilities, but it did define a dwelling as overcrowded if it had more than two persons per room (children under 10 were counted as half a person). ....the greatest degree of overcrowding (that is, more than eight persons per house). In 1901, most people rented their houses rather than owned them, partly because of economic and geographical mobility, partly because mortgages were not yet easily available. However, those further down the social scale paid a higher proportion of their incomes in rent. In "Round About a Pound a Week", Maud Pember Reeves calculated that whereas, in 1913, an upper middle-class family with an income of £2,000 p.a. would probably spend one-eighth of its income (£250) on rent, rates and taxes and a middle-class family on £500 p.a. would spend one-sixth (£85) on those items; a poor working-class family on £62 8s p.a. might spend as much as a third of its income (8s a week) on rent. the number of rooms occupied if less than five." with less than 5 rooms occupied. My mother was born in Middleton by Wirksworth in 1924, a third child to William Franklin & Mary Annie Hallows. They lived in a house in Middleton with one room down stairs and one room upstairs. All together there were 6 children in the house. The upstairs room was divided by a curtain, the parents slept in one side and the children in the other. There were 3 boys & 3 girls, as the boys grew older, they were moved to makeshift beds in the downstairs room. There was a scullery attached to the back of the house with a cold water tap and all hot water heated on the fire. An outside lavatory was shared by 2 families. My grandfather William Franklin worked on the railway as a porter and earned a pound a week. He gave 19 shillings to his wife, the children got a penny each and the few pence left went towards his cigarettes. By 1938 he had decided to move to Derby where he got one of the mid Victorian houses owned by the railway in Midland Place near the station. Three bedrooms, a front parlour, back kitchen but still an outside lavatory and no bathroom and he thought it was luxury. In reality it was still a terrible house with rats & cockroaches swarming in the cellar and all hot water heated on a kitchen range. There were no improvements made until after his death in 1971 when all the houses in Midland Place were bought by the council, gentrified and sold off. The worst thing was that Mary Annie Hallows's parents Samuel and Sarah Ann Hallows were renting the Old Manse in Coldwell Street in Wirksworth where there were more rooms than you could count but because of a family fall out, they never offered any better accommodation to their daughter and the growing family. Such is family life sometimes !! Hi John...I imagine all of those 9 people must have been at home on the night or do you think they might have been "double booked"! I bought a tiny little cottage here in Penzance in 1977. It had 2 bedrooms, one about 10'6" x 10'6" and the other was only 8'6" x 5'6". There was a lounge that was 7'6" x 10'6" (the fireplace accounted for the extra 3' in most places) and there was a kitchen under the little bedroom. The stairs went up from the kitchen, there were only 8 stairs so the roofs were low too (Cornishmen are known for being no more than 5'6"! so they could get down the mines! Now, in the 1940s and even the 1950s we were told there was a family of 10 children - surname HARVEY - living their with their parents and grannie!!!!! How do you work that one out? Oh, and there was a privvy at the end of the yard which was a very short yard. In the lounge as you came through the front door straight off the street, on the left running the whole length of the 10'6" wall was a bench, this is where the children sat when they were at home. Grannie slept in a chair in the lounge. Now, of the 10 children they were, I believe, fairly evenly split between girls and boys...the boys, like their father were fishing usually from a very young age so most of the time they were at sea. The girls had gone into service and only returned home on Sundays. So, that's why I'm wondering if all those people were at home that night or whether some of them might have worked day shifts and others nights? It's not been easy to identify this house and the neighbouring houses on the censuses because ours, in 1977, was referred to as 4 Carnes Buildings, Queen Street...There are 3 number 4s in this street! Carne was one of the local bankers (Batten, Carne & Carne) who went bankrupt and they owned numerous properties in the town which were then sold off. The numbering has never been updated...which is ridiculous. Opposite is Coulsons Buildings...and they have a No.4 and then there is No.4 Queen Street...leave off the section about "Buildings" and the postman is lost. We immediately gave our little cottage the name "Carnes Cottage" and after that there were no problems...except everyone in the town thought we were Mr & Mrs Carne and addressed us as such! Sorry that's not related to Wirksworth but it shows how 13 people could "live" in a tiny space! An interesting analysis John. I am particularly surprised by the farmer & family, not only because of the ages of the children but because it breaks a pre-conception that farm houses are usually a little larger than their neighbours. It will be interesting to see if Disley, a medium sized village, has similar over crowding. Some time ago I checked both my house and the house my husband previously lived in; on the 1901 census. Our home now has two bedrooms, but in 1901 would have had two bedrooms and an attic (one of the bedrooms is now a bathroom and the attic a dormer bedroom) in 1901 there would have been an outside privy (not sure if one for each house or shared). There were 11 people occupying the house on the 1901 census - a family and some lodgers and it is now occupied by just the two of us. My husband came from a huge six bedroom house which was presumably 4 beds and attic in 1901 and I seem to remember there was a gentleman with two servants living there in 1901. We are in West Yorks rather than Derbyshire but I suspect it was much the same the country over, the larger properties being owned by the people who could afford servants and the smaller properties occupied by families who overcrowded themselves with lodgers to make ends meet. Actually the second time. This information also appeared in 1891. I used it to compare houses which appear to have been extended between 1891 and 1901. In my village, it seemed to be about 12%. Of course, this is only small houses with less than 5 rooms.